Here are some of my favourite beekeeping links, where you can find lots of free beekeeping resources and information. I'll be adding more links as I go along. There is quite a lot of information on this website too, including information about the standards for organic beekeeping, downloads of construction plans to build your own bee hive, inflormation about Varroa mites, and some general articles. Alternatively you may wish to view these short beekeeping video clips. I also recommend this page featuring breathtaking clips from 'Wings Of Life' - or 'Pollination - A Love Story That Feeds The Earth' by Louie Schwartzberg; and also this interview with the director of The Strange Disappearance of the Bees, Mark Daniels. PLEASE NOTE, CLICKING ON ANY OF THE LINKS BELOW OPENS A NEW WINDOW. A great concept! No matter where you are, why not create a bee friendly zone? Whether you only have the use of a window box or a huge field, you can make a difference by creating bee-feeding stations across the country! Great site for resources, and a friendly forum of natural beekeepers. Link to other natural beekeepers in your area, and ask for advice and input. 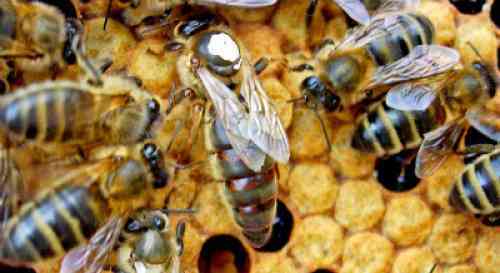 Bee conservation and Natural Beekeeping resources. Some great advice on this website - including a useful monthly tip, and a number of free downloads. Specifically providing lots of information and detail about beekeeping with Warré Hives. Link back to the main beekeeping page, connecting to various links. Calendarised lists of nectar and pollen rich plants for bees, including wildflowers, garden plants, herbs, trees, shrubs and even fruit & veg! Find out about the problems faced by our honey bees, including in-depth information and links to studies about neonicotinoid pesticides. How much do you know about bees? Test your knowledge with a fun quiz!